Front page of the game. 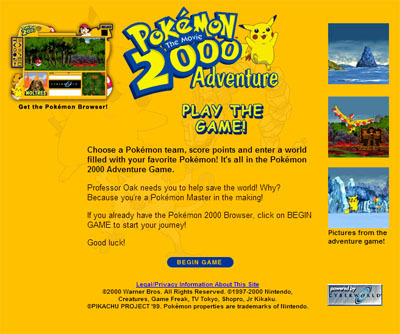 Pokémon 2000 Adventure Game was an online game developed by Cyberworld International Corporation as a tie-in to Pokémon: The Movie 2000. It utilized Cyberworld's proprietary QBORG technology to display 2.5D environments in a specialized browser. According to Neil Marshall, who served as a programmer and technical director for the project, the game was only available for four weeks before being pulled due to "a contract dispute". However, at least one file existed as late as 2003, and the front page of the game existed as late as 2009 according to Wayback Machine. The beginning of the game has the player set their name, choose a Pokémon team, and selecting difficulty. The player navigates a 2.5D environment, with web pages displayed on a side panel allowing for further interaction with the game world. The goal of the game was to travel to three islands, each guarded by one of the three legendary bird Pokémon, Moltres, Zapdos, and Articuno, and retrieve an Ancient Sphere from each island. Each island involves multiple levels and barriers that the player overcomes using their Pokémon team. There are also other Pokémon scattered throughout as well as Poké Balls that have a chance of either leveling up a Pokémon or resulting in a random Pokémon from their team being stolen by Team Rocket. At the end of the island, there is a shrine that the player gets an Ancient Sphere from by answering trivia questions. There seems to be no information on what happens when all three Spheres are acquired. Warner Bros. has since shuttered the domain the game resided on. Between archives of it and of the older domain www.p2kthemovie.com, all that is left of the game are some HTML and supplementary files, shortcut files used to display said HTML in the browser, some sprites, and seven levels. LMW user DoomTay has also contacted Marshall about obtaining a more complete copy of the game, but he has replied stating that he did not keep a copy because the browser "wouldn't run past a specific date (or it was tied to an old version of Internet Explorer and wouldn't work anymore)" In actuality, the browser has been found to work in Windows 10 with little issue, apart from a minor visual glitch rectified by resizing the window. 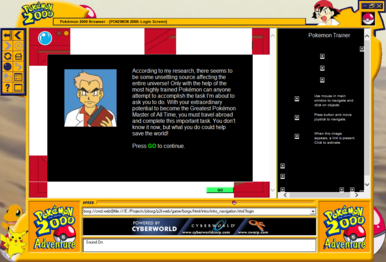 Professor Oak enlists your help. A view of Zapdos's Island from the Islands level. Wayback Machine crawl of the front page at the game's original domain.